Aliso Viejo, California, April 18, 2017 – Zettler Controls extends their line of HVAC/R definite purpose contactors with UL approved 4pole, 25-40 Amp versions. The 4-pole XMC0 25-40 Amp contactors are able to switch heavy loads in applications such as elevators, cranes, hoists as well as typical HVAC/R products. 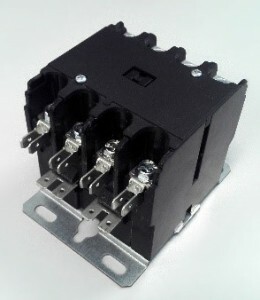 The 4 pole XMC0 Series of high performance definite purpose contactors offers UL rated contacts of 25 through 40 Full Load Amps, up to 600V and coils rated Class F. The XMC0 contactors are built and tested to meet the ARI780/790 standard for industrial applications.